Since May, forty U3As over the five networks registered an interest in being kept informed with developments on the memory courses initiated by Aughton and Ormskirk U3A. Twenty-eight of these updated Lynne Cox for the latest issue of the Memory Newsletter which can be accessed from the Publications Section. Missing set of U3A Sashes - Can you help? A set of U3A Sashes is currently lurking unreturned in one of the East Midlands U3As. The Third Age Trust needs them to be sent back as soon as possible. Please contact Michaela Moody (EM Regional trustee) if you know the whereabouts of these sashes. 10 Nov 2012 Update - sashes traced, item closed. On the 1st of October Dr Alex McMinn gave the first Nottinghamshire U3A Network lecture at the Richard Herrod Centre, Carlton, to 66 members from 13 U3As from U3As in the County. Alex’s theme was the role of the U3As in their communities. U3As have a vital role in their communities and can do much to enhance the wellbeing of retired people. Do find out more from the summary of the lecture which is on the Nottinghamshire Network website (follow this link). Alan Morris. The Royal Concert Hall, Nottingham are pleased to be able to offer tickets for the Northern Sinfonia on Friday 12 October at the special rate of just £10, including the best seats in the house (normally £32) to U3A members. To book, just call the Box Office on 0115 989 5555 and quote ‘£10 Offer’. 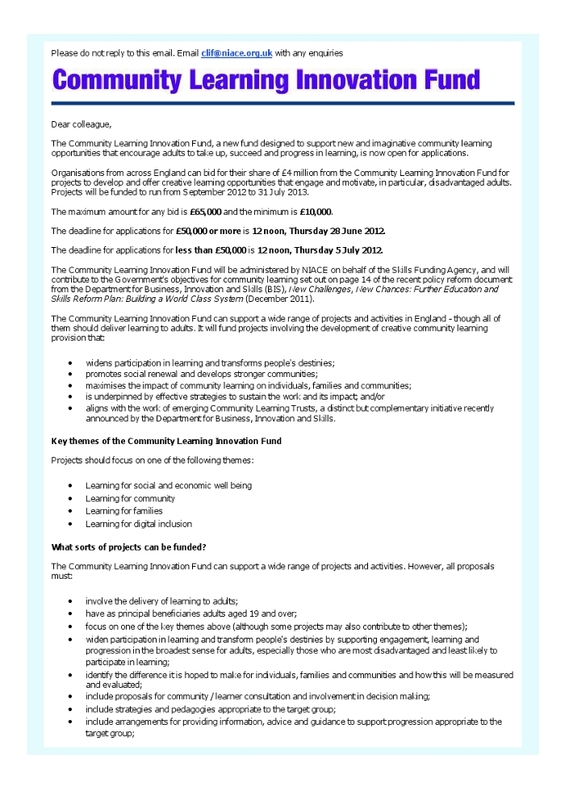 Full details in this letter. The Constitution approved at the AGM and the Annual Reports prepared by the officers are now available in the Publications Section. The current representation on the Regional Representative Council (RRC) is shown in the People Section. Over 100 members attended the East Midlands Region Conference and AGM held on Tuesday 10th July at the Link Hotel Loughborough. The conference chair and the speakers provided a most entertaining, informative, lively and interactive event. Committee member Barry Hillyard (Leicestershire representative) took photographs that can be seen in the Events Section. Ian Taylor of Buxton U3A would like to discuss with U3A family history group leaders the idea of holding a family history conference/seminar in 2013. Ian is willing to arrange a venue for the discussion, in Buxton, for the morning of Wednesday 1st or Thursday 2nd August. This seems a really good idea. Please contact Ian directly by email at taylor.ian9@gmail.com. Alan Morris, Regional Chair. It was with great sadness that I learned of the sad death of Bob Carter who I knew as a friend as well as a U3A colleague. Bob and I exchanged stories of our medical conditions but the news of his death came as a shock. We also swapped views on Leicester Tigers Rugby Club who Bob had supported for 60 years. Indeed, he treated me to lunch at the Castro/Murphy restaurant. Bob was well known as Chair of Leicester U3A and Treasurer of the East Midlands Association. It was his quiet and wise counsel which took us into the new regional structure with financial security. Fewer U3A members will know that Bob was Secretary to the Working Party which planned the new Network-based structure of the Region and which is admired nationally. Bob wrote a consise report which persuaded the Association to adopt the proposals. It was a professional piece of work. Bob did many things for U3A involving, for example, his beloved walking and history. I shall always remember enjoying his company at national annual conferences to which Bob was able to contribute. U3A has much for which to thank Bob Carter. He will be sadly missed. Alan Morris, Regional Chair. The author Heather Shaw contributed a great session for the recent East Midlands U3As Creative Writing Workshop. 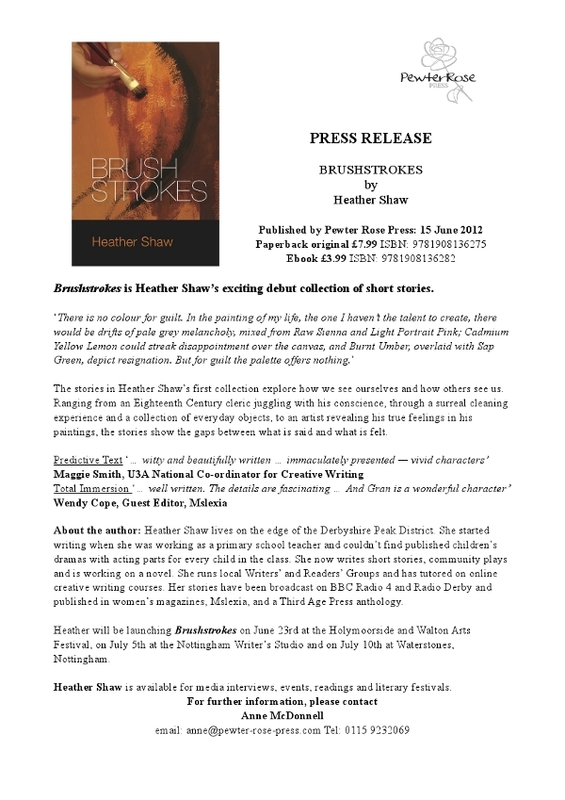 She has a debut collection of short stories 'BRUSHSTROKES'. 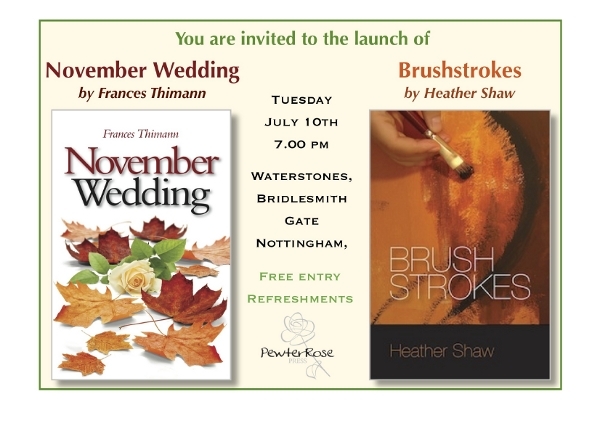 You are invited to the launch on Tuesday 10th July at 7.00pm in Waterstones, Bridlesmith Gate, Nottingham. See the Launch Invitation and Press Release below for details. Ilkeston and Long Eaton U3As have organised a joint picnic and welcome members of other U3As in Derbyshire. See Networks Section for details. 11th May 2012 saw the Chesterfield Canal walked by 185 U3A members from Ashfield, Arnold, Burton Joyce, Chesterfield, Dukeries, Mansfield, Retford and Worksop. Each U3A had a section of the canal towpath to navigate, each was responsible for its own members transport, safety. The weather was kind to us on the day, even though certain areas did prove to be a little on the muddy side!! As each U3A completed their section they then proceeded to St Anne's Church Hall in Worksop where a Hog Roast awaited them followed by tea/coffee and biscuits. A total of 167 were fed and watered. After the meal, there was a surprise performance by Worksop's own Steel Band of Breakfast television fame "Steelpantastic" to the delight of the members. A great day was enjoyed by all, and one e-mail said "What a great way to start the Jubilee celebrations". I hope you find this report encouraging that so many members actually had taken part. We think it was fantastic and worth all the effort. 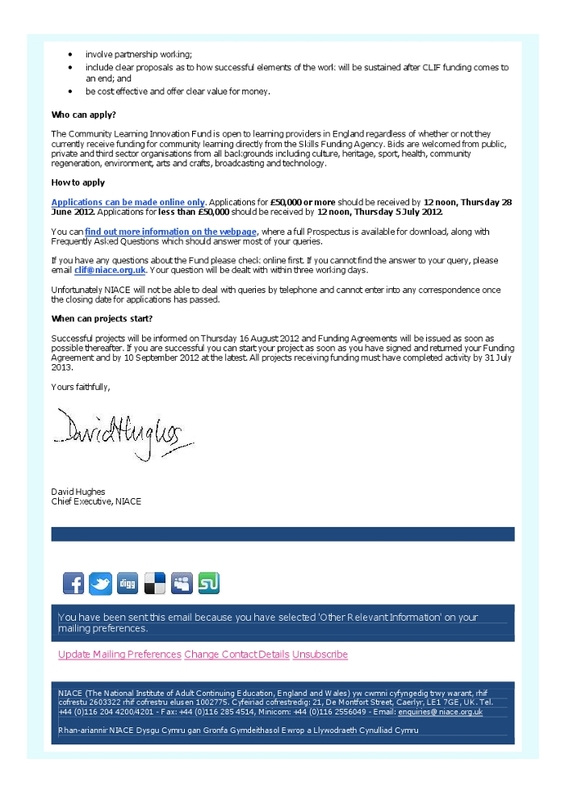 The East Midlands Region of the U3A has been sent an email by David Hughes (Chief Executive of NIACE) and we have circulated it to all U3As in the Region, among others. I would encourage U3A Committees to consider it. If you do decide to bid I should be grateful if you would let me know so we can share experience with other U3As in the Region. Alan Morris, Chair, East Midlands U3A. The minutes of the RRC meeting held on 9th May 2012 are now available in the Publications Section. These have been Agreed by the Chair and will be considered for Confirmation at the next meeting to be held on 12th September 2012. Issue 2 of Regional Memory Newsletter has been prepared by Lynne Cox and is available in the Publications Section. Following the very successful Regional ‘Memory’ Workshop (held on 7th March) Lynne Cox has been appointed Regional Coordinator for Memory Courses. The Coordinator’s role is to help those U3as which ask for it to provide the Memory Courses which were the focus of the Workshop. Lynne, of Whitwick U3A, has a recent degree in psychology and has been involved with not only her own U3A Committee but in Leicestershire and the Region. Lynne will be in touch with U3As shortly. Issue 1 of the Regional Memory Newsletter can be viewed in the Publications Section. A Creative Writing Workshop for Group Leaders is to be held on Wednesday 23rd May to enable participants to meet, discuss ideas and problems, gain ideas from each other and from the providers, and establish networks as a basis for future development. Read more in the Events Section. In September 2012 Liz Wilson completes her three year term as the Region’s Trustee and she cannot have another term (or year). Therefore, members are invited to consider putting themselves forward for this important and interesting post. Read more in the People Section. The U3A in the East Midlands is organising a Workshop for U3A Chairs, Secretaries and Groups Coordinators on Wednesday 18th April. Read more in the Events Section. Memory Workshop Notts County Football Club Wednesday 7th March 2012. A flier has been sent to all U3A Business Secretaries as a hard copy and electronically via the U3A’s contact person.). See Events Archive for the archived details. An article for U3A News by Nottinghamshire Network retiring chair Jean Hogg is available in the Networks section under Nottinghamshire. The design of the site has recently been changed to add more sections. If you have information to go on the site or can suggest ways to improve the site please Contact Us. Find out more information on the NIACE webpage.